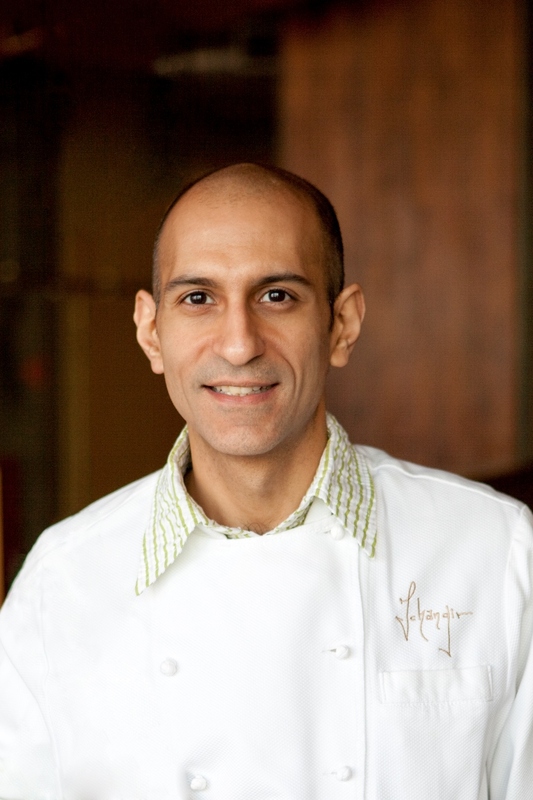 Mumbai born Jehangir Mehta, is executive chef/owner of two popular New York restaurants, Mehtaphor (Tribeca) and Graffiti (East Village) and his new venture, Me and You, a private dining experience and conversational salon. He is also the National Foundation for Celiac Awareness’ (NFCA) Chef Ambassador of their educational initiative “GREAT Kitchens”, which offers training on cross-contamination issues to restaurants and other food service providers. Beginning last October, Chef Mehta and the GREAT Kitchens’ team embarked on a 10-city “Chef’s Table Tour”. Chef Mehta’s mission … to spread awareness of celiac and gluten sensitivity, train kitchen staff in cross-contamination, while also showing other talented chefs around the nation that gluten-free food can be innovative and delicious! The first stop on the tour was at Chef Mehta’s very own, Mehtaphor. Congratulations Chef Mehta on the success of your New York restaurants, Mehtaphor and Graffiti, on being a Next Iron Chef Finalist, as well as in your role as Chef Ambassador of NFCA’s GREAT Kitchens’ program! I’m pleased to share with our celiac, gluten sensitive and wheat allergy readers that both Mehtaphor and Graffiti are “graduates” of the program! Please share with our readers more about the Gluten-Free Resource Education and Awareness Training (GREAT) Kitchens’ program and where can restaurants sign up? Well, thank you so much. That is so kind. It’s been exciting to watch GREAT Kitchens “grow up” since I’ve really been with NFCA from the beginning. The wonderful thing about GREAT Kitchens is that it’s not just a training program. It teaches everyone in the restaurant the reason behind the commitment we ask them to make and then helps them to assess their operations to determine how they can offer gluten-free safely. The program gives you a shield to address these problems correctly and the tools help to minimize the risk by arming you with knowledge of the small things you may not consider. From a practical standpoint, GREAT Kitchens is five multi-media modules, but can be delivered in person, as well. It also has a training manual with resources that will save managers so much time as they try to simplify the process. It includes a self-audit checklist, training logs, posters, recipes, supplier lists and even an allergen supplement. Why did you decide to take on the role of Chef Ambassador and travel with the GREAT Kitchen’s Gluten Free Chef’s Table Tour? Do you have a personal or family history of Celiac/Gluten Sensitivity? I attended a Gluten-Free Cooking Spree which NFCA held in New York when Anheuser Busch launched Redbridge, their gluten-free beer, and noticed the work that NFCA was doing around educating chefs, doctors and the media about celiac disease. I really began to follow their work and attended additional events to support the organization. When they asked me to be their Chef Ambassador I was thrilled. I am able to share my expertise and knowledge on the topic to educate the chef community. When I learned that some people with celiac disease don’t get better even after their diagnosis because they continue to be exposed to gluten, I thought that was tragic. I don’t have a personal connection but I view it as my job as a chef to shed light on this problem so that we can do better … we must do better. In addition to New York, which other cities did you and the GREAT Kitchens’ team visit and are you aware of any restaurants becoming 100% gluten-free after your visit? I don’t have a family connection to gluten-free, so my commitment stems from my interest viewing food as a conduit for wellness and a vehicle to develop intimate communities. Everyone should be able to enjoy the very basic human act of eating a nourishing meal together. We visited Seattle, Portland, Los Angeles and San Francisco. I’m not aware of any restaurants becoming completely gluten-free after our visit, but this was not the basis of our tour, it was to educate chefs on how to take corrective actions when gluten-free diners are in the house. We did visit Pica Pica in San Francisco, which we were delighted to see because the restaurant has always been 100% gluten-free, which is pretty rare. Students with special dietary needs should feel safe in their dining halls. Did you visit and train in any University/College kitchens during the Tour? We visited a few colleges and found that while some have made an incredible commitment like Portland State, others still have a long way to go. Loyola Marymount had already been accredited as a GREAT School and it was fun to see the impact the program has had on these campuses. Did you find there was a moderate or significant lack of celiac awareness among the chefs/kitchen staff of venues you visited? As in the school setting, the existing knowledge varied among the venues we visited. We hope that the tour helped to stress the importance of proper education and protocols in order to meet the expectations of gluten-free customers, and that the training and exposure to the program made an impression. There are so many hotspots, it’s hard to pick one. One of the key processes is separation throughout the kitchen. You don’t need a dedicated kitchen to offer gluten-free dishes safely, but you do need to uphold strict processes. I’d say the grill is something that’s often overlooked because the perception is that the food is all burned off. That’s a good example. Rather than asking a yes or no question, just open up a conversation about how they prepare gluten-free food. If you are comfortable with the response, you can ask specific questions about how the dishes you are interested in are prepared. If you don’t have confidence, don’t take a risk. Either give the manager (or even chef directly) specific instructions or go somewhere else. If you are planning to arrive at a busy time, its best to call ahead, if possible. Don’t forget to double-check, though, to make sure that the staff on your shift are as knowledgeable as the person who spoke to you on the phone. Eliminating wheat, barley and rye in a dish seems easy enough (I’ve learned to cook fairly well without them!) as there are so many fresh, delicious ingredient options and GF alternatives available, do you think more restaurants will be moving in the all gluten-free direction, upon hearing so frequently about the evils of wheat? I think many restaurateurs are trying to cater to a variety of needs and many are finding that the easiest way to do that is to simplify. Providing clean food made from fresh ingredients is healthier for everyone. And introducing flavors from around the world always enhances the experience. There are so many naturally gluten-free foods that it’s easy to build a whole menu if that’s your goal. Are you aware if the GREAT Kitchens’ program is less costly than other kitchen certification programs? If yes, this could be appealing to restaurant owners who may have avoided training programs, due to the expense. There are no other gluten-free training programs that offer the same depth of content available online 24/7 where you can learn at your own pace. In my experience, the cost of putting one manager through GREAT Kitchens will be made up in one large party or two average-sized tickets. How can I, and CeliacCorner followers, do more to spread awareness to restaurant owners about NFCA’s training course? Thank you so much for helping us spread the word! I recommend that your followers download NFCA’s Dining Tips Sheet (www.EatWithoutFear.org) and bring the coupon to your local restaurants. Tell the owner or manager that restaurants that have completed GREAT Kitchens training get better restaurant reviews and more people downloading directions as a result. For the pineapple granita, heat the sugar and 1 cup of the pineapple juice in a small saucepan until the sugar dissolves, stirring occasionally. Remove from heat. Stir in the rest of the juice, and cool in an ice bath. Pour into a flat metal container such as a sheet tray, cover and freeze. Once it becomes solid, break it with a fork so that it becomes flaky. Re-cover and return to the freezer. For the salad, in a large bowl, toss together the oranges with the almonds, almond oil and micro herbs. Serve on chilled plates with granite scattered around. See what NFCA is up to for Celiac Awareness Month! We hope you found our Q&A with Chef Mehta informative, what are your concerns when dining out gluten-free in restaurants? Will you be spreading the word about NFCA’s GREAT Kitchens’ program to a favorite restaurant? Feel free to comment below. Great Q+A! The gluten-free Trend has made it very difficult for us to keep safe. I don’t believe the waiters take us seriously any more. I find myself really grilling the servers now, more than ever. I hope more restaurants will sign up for the training. 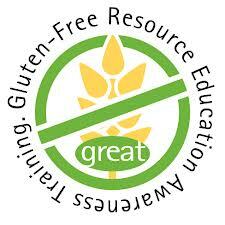 More and more restaurants are becoming aware of the need to have gluten-free preparation, service and recipes. It’s disheartening to see a blank stare on a waiter’s face when asked if an item on the menu is gluten-free or if they provide for that…..Great news to see the Foundation and it’s training program.